What a great night! 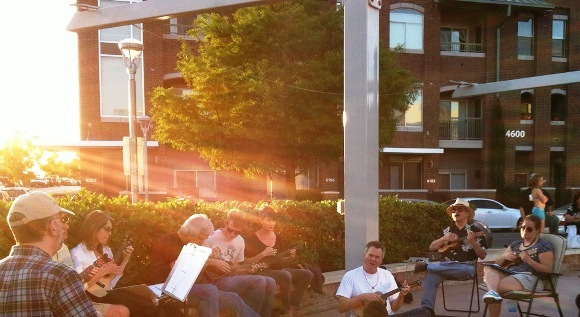 Beautiful weather, 25 ukuleles being strummed, appreciative passers-by, and a bunch of fun songs to play. What’s not to like? We’ll definitely see if we can’t squeeze in one more outdoor meeting before it gets too hot. Thanks to everyone who came — and a special shout out to the first-timers who joined in. Welcome! As Bob said, we hope to organize another outdoor get-together soon, so watch this space, and our Facebook page, for more information. Please don’t forget to suggest any songs you’d like to see (and hear) us sing by dropping us a line (austinukes@gmail.com) or sending us your comments. Our next monthly meeting will be Tuesday, May 10th at 7:00pm at our usual spot, the Community Room at the Central Market on North Lamar. See you then! 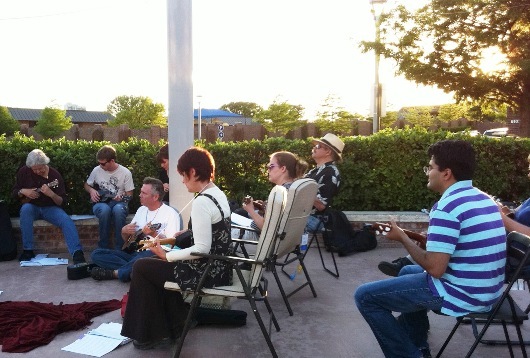 This entry was posted in AUS activities on April 30, 2011 by Austin Ukulele Society.